Ackworth Friendship Book [J1107] - $18.00 : Yarn Tree, Your wholesale source for cross stitch supplies. Cross stitch pattern by With My Needle. 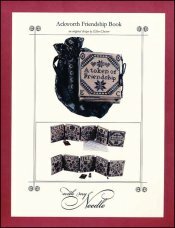 Many Victorian women created friendship books. The women would ask their friends to make handwritten entries, and many included lovely drawings. Some friends would also include small tokens to be kept with the book. This friendship book design, in an accordion style, features the alphabet with floral motifs. On the front of the book "A token of Friendship," is stitched. This design would be perfect to get a few of your close stitching friends and have them each stitch one of the inside pages, or you could stitch the entire book yourself and dedicate each page to a loved one. Friendship is the sweetest flower. Stitch count is 61W x 65H.